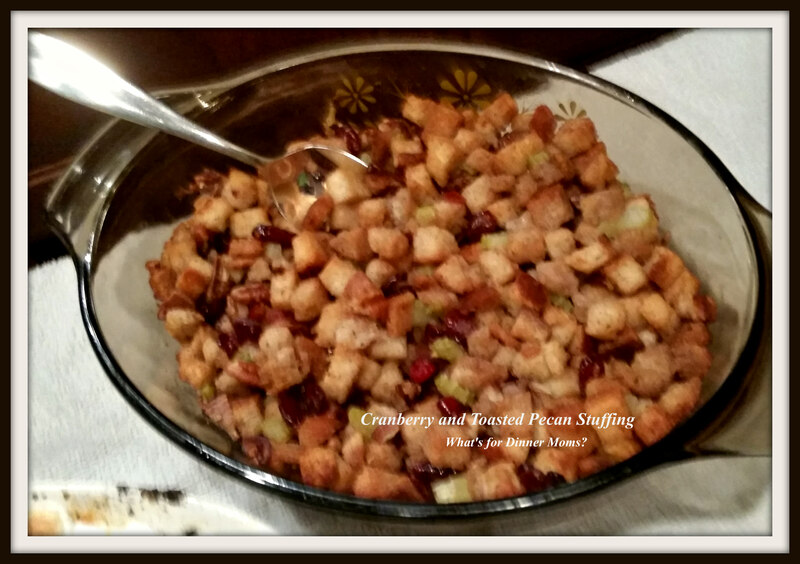 Traditional Craisin and Toasted Pecan Stuffing – What's for Dinner Moms? Getting a later start to the day than usual. I went to vote this morning and the line was out the door. I have NEVER had to wait more than 10 minutes to vote. It was crazy. But, I waited and then my daughter and I went out to breakfast. So, everything is a bit off today. I hope if you are able (and in the US) that you either have voted or will be voting today. I truly believe it is our responsibility as citizens to do our part and vote. We may not like the choices we have to make but we need to go out and do our part. I went very traditional this past weekend with our Thanksgiving dishes. Usually I make an Italian sausage stuffing (or dressing) for our dinner. But, I wanted to make it a bit lighter this year. I switched out the Italian sausage for Craisins and added toasted pecans to the mix for a bit of crunch. All but one preferred this stuffing for Thanksgiving. Thought they all really like the Italian sausage stuffing it is much heavier and with this lighter stuffing they felt like they could eat more of everything. This recipe makes a big batch. There was plenty to use as stuffing (cooked in the turkey cavity) or dressing (cooked in a separate bowl from the turkey). Preheat oven to 350 degrees (if making dressing) or to temperature recommended on your turkey if making stuffing. In a large bowl mix together bread cubes, pecans, sage, thyme, black pepper and Craisins. Melt butter in a skillet over medium heat. Add celery and onion to skillet. Allow celery and onion to soften. Pour onion mixture over bread mixture. Add chicken stock and stir well. Stuff into turkey allowing enough room that stuffing can heat to appropriate temperature or place in a glass pan and cover with aluminum foil. Bake in glass pan 30 -40 minutes until heater through or if stuffing turkey according to package directions. YUM! This has me super excited about “Fat Pants Day” AKA Thanksgiving. We actually had to tell my son this year that pants are required for dinner. Lol. He put on his sweatpants! Thank you! Hope you are doing well today! I am just falling in love with your blog!!! I voted! Nice change for a lighter stuffing! Thank you! Glad you voted. I am a huge believer in everyone voting in all elections! Thanks, Lynn! Hope you are all well. Have a wonderful weekend!